A great editorial overview of this Surrey real estate development pre-sales project by Susan Boyce of the New Homebuyers’ Guide of Vancouver. Republished to promote this great Salus Surrey condo project as it provides world class lifestyles and is in tune with the environment. In Latin, Salus means “Wellness.” Today, wellness is about to be taken to a whole different level. Presenting the new Surrey pre-sales Salus real estate property, Adera’s stunning resort style community at Scott Road and 66th Avenue in Surrey. “Salus is going to be something really new and refreshing to the Surrey real estate market,” says Eric Andreasen, Adera’s Vice President of sales and marketing. “Everyone has amenities, but Salus Surrey real estate is going to be a complete wellness centre. Now, you won’t need to travel to Whistler to have a true spa experience – you’ll be able to enjoy it right here at home.” I can’t wait to learn more. Like every Surrey community Adera builds, Salus will aso be designed to BuiltGreen standards. Motion activiated lighting and a comprehensive recycling program are just a few of the ways Adera ensures your new home at the Surrey real estate presales condos at Salus will leave only a minimal environmental footprint on the environment. A minimum of 50 per cent of common area lighting at the preconstruction Salus condos in South Surrey real esate is CFL for reduced energy consumption – and low VOC materials help eliminate harmful off gassing. Salus condos in real estate Surrey pre-sales market offers a total of 398 homes ranging from one bedroom condominiums to spacious three bedroom townhomes and is located at Scott Road and 66th Avenue in Surrey real estate preconstruction. Priced from the low $200,000s to the mid $400,000s approximate sizes of these Salus condos and Salus townhomes in Surrey are between 550 and 950 square feet for condos and 1,150 to 1,580 square feet for the townhouses. Be sure to ask about Adera’s Signature Series Upgrades at the Salus Surrey real estate condo pre-sales – a selection of more than 70 different finishing options to customize your home so it’s as individual as you are. Be one of the first to see for yourself. VIP previews for the Surrey Salus real estate condo homes begin at Salus in the first week of April. Register today to receive your priority invitation. For more information about this new pre-construction Surrey real estate Salus development, please call 604.507.0065 or visit www.adera.com. Your choice of contemporary Salus Apartments or Traditional Salus Cityhomes in this spa inspired resort Surrey real estate development. Interest Rate Buy Down and custom Upgrade Allowance package is now available (limitations apply, see sales rep for details. New offers September 1 – 30, 2008). The Surrey Salue Cityhomes for sale: when you’ve always dreamed of townhome living, why settle for anything less? Stylish Built Green Contemporary Adera Salus cityhomes are now for sale starting with two bed plus den units from $359,900 and four bedroom townhomes from $389,900. The presale Salus Surrey apartment flats: why rent when you can own? Affordable Built Green Surrey apartment flats at Salus Resort can be yours now starting with one bed plus den from $209,900, two bedrooms from $269,900 and three bed suites from $299,900. The Salus Cityhomes and Apartment Flats Surrey presentation centre is now open everyday noon to 6pm at 6628 – 120th Street in Surrey BC. 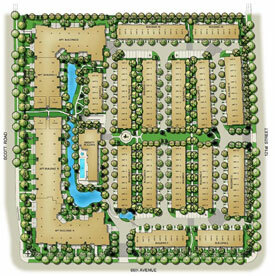 Call 604.507.0065 for more information about this Surrey Built Green real estate development by Adera Properties. Wellness can be yours at Club Aqua at Salus Resort in Surrey, an exclusive spa, plus a first class amenity centre, fitness gym, outdoor salt water swimming pool and hot tub. “Salus is designed with a strong, Coastal Mountain architecture to give the preconstruction community identity within the local neighbourhood,” Eric says pointing out Salus’ use of massive timber beams, natural rock, cedar shingles, and angled rooflines. “it will be like escaping the every day whenever you come home to Salus Surrey condos. And there are so many different parts to our trail system that you could jog every morning without taking exactly the same route.” But for me, there’s no question it’s Club Aqua at Salus Surrey pre-sales real estate, the true heart and soul of this community, that’s top on my list of “oh wow” factors. Overlooking Surrey Salus’ main water feature, Club Aqua Salus appears to grow organically from the ground – like the mountain forests it draws inspiration from. First consideration is whether to swim a few laps in the outdoor pool at Salus Club Aqua Surrey, soak in the covered outdoor hot tub, or sweat away stress in either the sauna or aroma steam room. Later, perhaps I could check out the luxuriously appointed entertainment room that opens onto a 3,500 square foot rooftop deck at Club Aqua Salus real estate condo properties in Surrey BC which is definitely where you’d be sure to find me soaking up a few rays on a sunny summer afternoon. Of course, that would be on the days when I decided not to snag a table with a shade umbrella so could finally discover who dunnit in the latest mystery novel to hit my bookshelves. Then again, I might decide to curl up in Club Aqua’s library or chill out in the Salus lounge with its soaring two storey fireplace. It’s all about choice and choice is good at the Surrey real estate Salus development resort. And just in case all this isn’t enough, Eric tells me that Salus will also have a 24 hour resident concierge and professionally managed spa services. Okay, so now I’ll also have to decide between a pedicure, a manicure, a faical or a massage? Well, it’s a tough job, but just twist my arm a little harder and I’ll volunteer to do it. Live at a Destination Resort Spa at Salus Surrey! Watch the video "Living the Experience" at Salus real estate Surrey. Everyone is talking about Salus! It might have been any of the obvious: the signage and banners along Scott Road in Surrey's real estate market; the dramatic change noticed in the new master planned community by the construction of our enormous on-site sales presentation centre, or; that Adera, an award winning developer of quality product for over 39-years, was bringing a new concept Surrey community to the neighborhood. Many of you told us personally, however, that most people are talking with feverish excitement about how they plan on "living the experience" at Salus condos presales in Surrey! The experience of living in a legitimate West Coast Mountain Resort Spa-inspired community! A functioning, professionally managed Spa for the purpose of bringing balance back into their lives. Balance though professional treatments and wellness. Balance through fitness and exercise. Balance through rejuvenation and regeneration including an active social life that comes from a community of 398 homes where like-minded people choose to live with a purpose! Wow! What they don't know? Our Surrey Salus apartment Flats will start in the low $200's! Our Salus Surrey City Home townhomes will start in the low $300's!! 1. For a taste of what you can expect, and to "feel the experience" of life at Salus, take a close look at our video clip. 2. Put yourself in the preferred position to take advantage of being one of the first to select and purchase a home at Salus by visiting our registration page. 3. Help make this the community of your dreams by telling someone that you believe should hear about Salus, or by telling someone that you would really like as your neighbor, about this community of superb homes. Help spread the news of Salus, what everyone is talking about, by forwarding the "feel the experience" video for their enjoyment. 4. See you at the VIP reception! Register now to confirm your invitation to a limited VIP priority preview. NOTE: VIP receptions start week of April 19. Space is limited. The Salus sales Centre is now open for viewing only. From the BC Westcoast Homes and Design magazine: High Buyer Response to Salus Points To Good Local Surrey Real Estate Market. Adera Group is releasing additional homes ahead of time for pre-construction sales to satisfy demand for its presales Salus townhomes and Surrey condominiums in this neighbourhood along the Langley border. The overwhelming repsonse to Adera Group of Companies’ Salus project in Surrey/Delta should do much to reassure home buyers that the local pre-construction property market is alive and well. A master planned community at Scott Road and 66th Avenue that includes a 6,600 square foot wellness spa, Salus Surrey townhomes and condo pre-sales is enjoying such a high volume of presale activity that Adera is now finding itself in a position of having to release additional homes well ahead of schedule to satisfy demand expected at the public grand opening. According to Eric Andreasen, vice-president of markeing and sales at Adera for the Surrey Salus condos and townhomes, the company has written agreements on all of the 42 city homes for preconstruction sales it had initally offerd in its first release. In addition, almost all of the 73 apartment condominiums at Salus by Adera also have been claimed. All of this activity happened even before Adera’s official grand opening which was May 10. When complete, Salus condos and pre-sales Surrey townhomes along the Delta border will be home to 398 West Coast inspired residences. Central to the community will be the resort style spa known as Salus Club Aqua, a sprawling facility that will house an outdoor saltwater lap pool, indoor/outdoor Jacuzzi, fully equipped fitness centre and a number of treatment rooms managed by a spa consultant. Complementing this reosrt style amenity are the West Coast insipred surroudnings of Salus Surrey townhouses and condo presales, featuring water, green space, natural landscapes, and foot trails interlacing the community’s homes. The pre-sales Salus Surrey homes themselves, also constructed in the spirit of a mountain resort, are of registered BuiltGreen construction. Ranging from 600 square feet to just under 1,600 square feet, the Surrey Salus Delta condos and town homes are well priced bewteen the low $200s to mid $400s. Adera introduces the Salus Built Green resort style community in the prestigious neighbourhood of South Surrey real estate. Your choice of contemporary presale apartments or traditional Salus cityhomes in this spa-style resort community are now available in the final release of presale condos. With a $10,000 interest rate buy down and $7,500 custom upgrade allowance now on new presale purchases of South Surrey Salus condominium residences, why rent when you can own? Affordable South Surrey Built Green apartment flats can be yours now starting from $209,900 for one bedroom and den and from $269,900 for two bedroom suites. In addition, there are impressive Built Green Salus three bedroom condominiums for sale from $299,900. The wellness Club Aqua presents an exclusive Salus South Surrey amenity centre complete with spa, first class services, salt water swimming pool, gym and hot tub. Salus Adera Projects Ltd. also presents South Surrey cityhomes that include three bedrooms from $339,900 and four bedroom family city homes from $389,900. When you’ve always dreamed of townhome living in South Surrey real estate market, why settle for anything else? Stylish Built Green Salus Townhomes present an exclusive collection of contemporary cityhomes for sale.